I use a lot of sports analogies in my job, and most successful teams have a coach that has been strict, or pushed them to reach higher levels of performance. There is a balance there in so many places in life, how do you push to get the results you need and know they can attain and still show you care about the people you are responsible for? 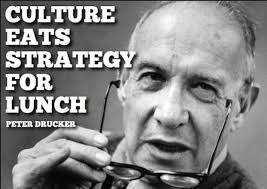 When everyone on the team knows what the goals are and what the values are, and everyone is in alignment with those things you have the foundation for a great culture. That alignment means that everyone is aiming for the same thing, you don't need to push, they are already going the same direction you are.